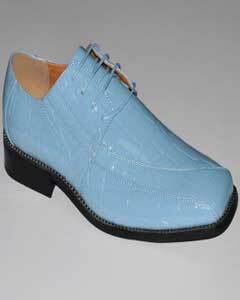 What shoes to wear with a Blue Suit? While the evolving trend to wear suits is increasing, the versatility of suits is depicted by what kind of foot wears are worn. The fact that an individual's shoes are observed at various events cannot be ignored. So wearing just the right kind of footwear which simultaneously matches the suit is important. This question which arises in everyone's mind about, "what shoes to wear with a blue suit", can be answered with the help of this article. What does a suit depict? Whether you're an office guy who needs to look sharp for board meetings, or a creative type who dresses up because he likes to, a suit will always flaunt your persona in front of your colleagues and will make your work environment better. Navy suits are the most flexible suits, but be careful what colour shoes you wear. What looks good with blue? It is always safe to wear black shoes. Any other colour of shoe is going to look casual with blue. It is observed that navy blue suits will go well along with brown or burgundy shoes. Navy can go comfortably with all three of the main colour families of men's leather shoes. You can probably even make a navy suit work with more exotic colours if you have them, although blue is generally too close to make a good contrast. The leather colour mostly affects the formality and attitude of a blue suit. Black shoes are business dress, while brown are more relaxed, and red or burgundy give it the most playful, social feel. Not only the colour but also the type of shoes one wears describes an individual. At MensItaly, there are a variety of footwear as well as the suits, one can choose from, just logon to their online shopping portal www.mensitaly.com to look for variety of stocks available. One should choose wisely according to the occasion. Nonetheless, there are a few conventions one should keep in mind when selecting shoes for purchase, or deciding which pair to don on a particular day. In general, sleeker the shoe, the more formal is its look. For formal affairs, revert to black oxfords made of highly polished, shiny leather, as well as heels and soles that are sleek and have as little bulk as possible. To get a casual look include slip on shoes like loafers to your wardrobe. They are also accepted as business formals at many places. Dress boots bring some ruggedness to dress footwear, making them a worthy option in the winter. In addition, these boots will look fantastic with dressy and casual clothes. It's not just the suit which makes a man trendy, it's the footwear which must be apt and should go along with the outfit which a person is wearing.